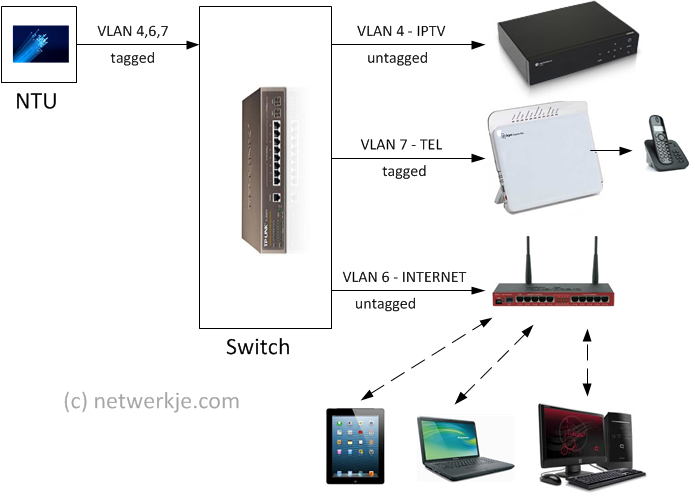 To make this possible I would have to be able to (un)tag vlan ports which seems possible in the edgeswitch interface, but seems to be missing from the edgerouter interface. You can do this with ER-X which has built in switch and you can configure PVID/VID on each port to your liking ER-L has only routed ports and you can't configure PVID. Ok so no GO for the ER-L. What about the ER-4? Or the new ER-6? ER-4 has no built-in switch either. So no. EDIT (correciton): ER-6 no either. What is your Wan speed? ER-X will do just fine up to 900Mbps. 750/750. Think I'll wait until the new ER-6 comes out. Moving to the ER-X feels like a downgrade and next to that I'm also looking to mount it in my rack and since I'm only finding rackmountkits online for ER-L (and ER-4) that seems to narrow my options. Pro is overkill for me. Too bad they went with the 24 VDC instead of AC though. You can do it, but you probably shouldn't. 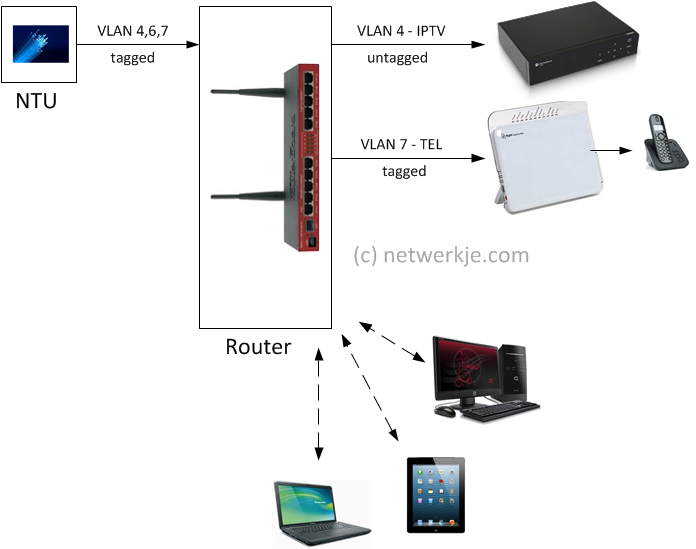 As others have pointed out, the ER-L has no l2 switch (without virtual bridging, which has significant performance penalties), so you'd have to route all traffic which would make your network diagram a little odd (vlan 7 on the NTU side would be a different vlan than on the TEL side -- even though they are both tagged with vid 7). That said, if you really wanted to you could setup separate virtual interfaces for vlans 4, 6 and 7 on both the NTU physical interface and vlan 7 on the TEL interface and then route between them. A virtual interface will always tag egress traffic -- and ingress doesn't matter other than determining which vif to use (because it's a router, not a switch). Respectfully, I would question your entire premise. A good l2 managed switch is invaluable and can typically handle much more traffic across its switch fabric than a router w/ SoC switching (I use a 24-Port HP Procurve myself at home, but there are lots of good options at that scale). ER-6 yes. But that is not available yet. No the ER-6P does not have a builtin switch either - they are all L3 (routed) ports. According to this the clock is faster, but both 2 cores and half the memory on ER-X.